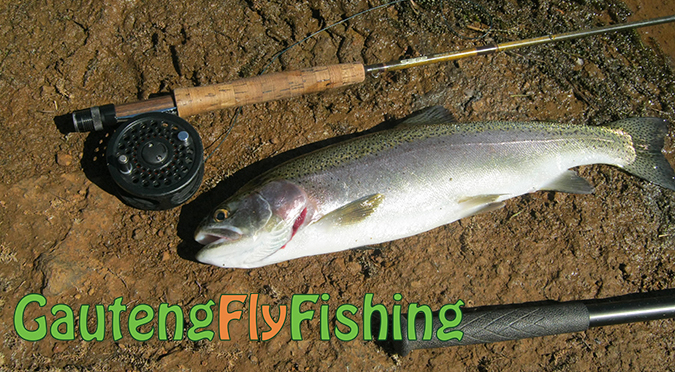 Gauteng Fly Fishing, Catch & Release… At Least They Are Trout! I must admit, fly fishing for Rainbow Trout in Gauteng is not my favourite thing to do. It almost seems un natural, as when I fly fish I like to be in wild places with challenging fishing, such as Dullstroom or the Drakensberg. But I guess, beggars cannot be choosers. The fly bug bit me hard recently, and I needed to fish. We tried for Carp, Bass, Barbel but the Winter was in full swing and the water temperatures all below 12 degrees. Eventually, after many days of blanking and the fly bug coming dangerously close to killing me, I accompanied Jason to Footloose Trout Farm. As he was a member, he could bring one person in for free and fish the members section. We were on the road from Edenvale at 5am, as we normally are for fishing, even though the sun was due to rise at 6.55am, and travelled to Footloose. We stopped for Coffee on the way and we were genuinely excited. We both love catching fish, no matter what tackle, what fish or what size, and it is always a great pleasure fishing with Jason. We started in the dark with wet fly, and around 6.30am. I landed the first fish, a nice, typical looking stock farmed fish, of about 300 grams. The first dam in the members section was going crazy as the sun rose, and we decided to fishing dry fly. Jason with a Stimulator and I tried the DDD, Adams and then the Elk Hair Caddis, which I managed to get a rise to. It was dead and I changed to nymphs, I fished about 4 nymphs and nothing, not even the Vlei Kurper were interested in a size 20 PTN. After quite a struggle we decided to change back to the sinking fly and provoke the fish a bit. The trout were feeding very particularly on small white insects hatching, and we just could not match the hatch exactly. So we fished Black Woolly Buggers and White Fritz and got many chases and lots of on off fish, and before 12 we had about 10 each, 2 good fish of about 700 grams. We ended up shooting some Gopro footage, the YouTube video is embedded below if you would like to watch it.